Fulper Pottery Vasekraft art pottery vase, being an early conversion to a table lamp, with shade. Matte green glaze, with an applied bronze foot ring depicting classical athletes in a running frieze surrounding the base. Size: 8 inches diameter x 8 inches ht. Dimensions including shade: 20 inches diameter x 20 1/2 inches ht. 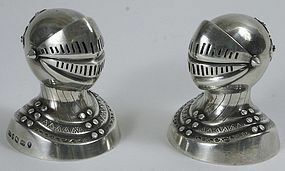 Double lamp sockets. Excellent condition. 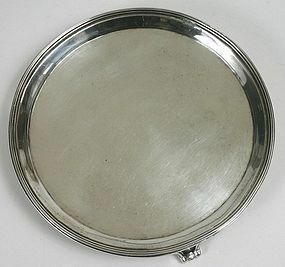 George III round waiter or card tray in sterling silver, London, 1802, by silversmith Thomas Wallis. Size: 6 inches diameter. No monogram 5.1 troy ounces/ 159 grams. No repairs, slight ripple in top commensurate with age and which does not detract from the appearance. 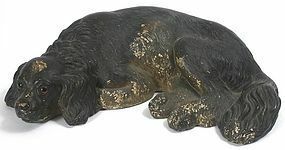 A rare and early chalk ware figure of a resting spaniel with finely molded detailing, glass eyes and the original finish. Circa 1870's to 1890's. 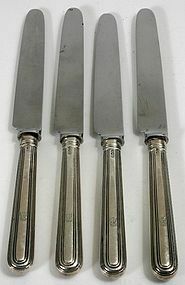 Size: 16 inches long x 4 inches high x 11 inches deep. A few minor chips to the underside, not visible on the exterior, and minor scuffing consistent with the age. Birks, Canada sterling silver bread tray, c.1950, with shaped edge, in excellent condition, no monogram. Size: 12 3/4" length x 6 3/4" width. Herend porcelain three-piece tea set, hand painted in the popular Rothschild bird pattern. 20th century. 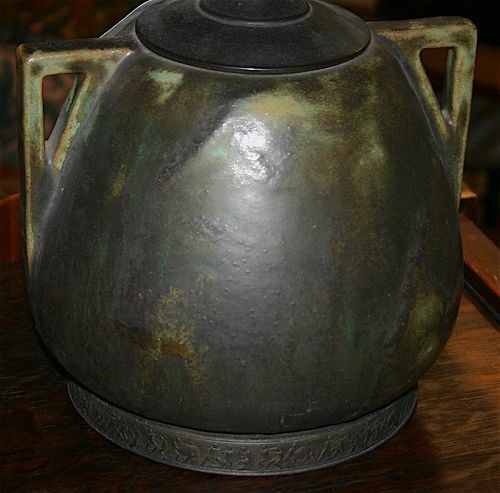 Size of teapot: 5.75 inches ht. 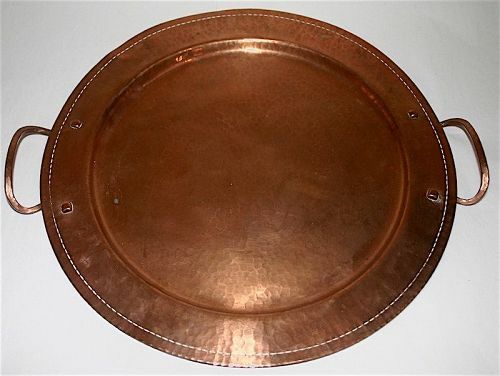 x 9 inches across spout x 5.25 inches diameter. Excellent condition, with no damage or repairs. #665/RO, 1603/RO, 1642/RO. 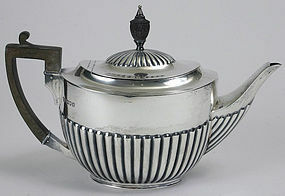 A wonderful set consisting of a globular teapot with bud finial to cover and tendril handle; covered sugar bowl with bud finial; and milk jug with tendril handle. 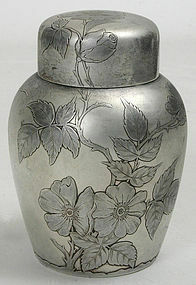 Aesthetic movement Gorham sterling silver tea caddy. Circa 1888. Size: 4.5 inches ht. x 3.25 inches diameter. Weight: 5.48 Troy ounces. 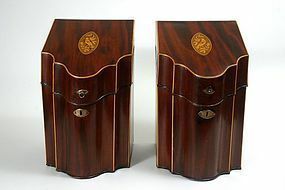 A fine 19th century American tea caddy in the Japanese taste with applied floral motifs. Condition: no repairs, but with a few small dings to the body. Gorham date marks for 1888. 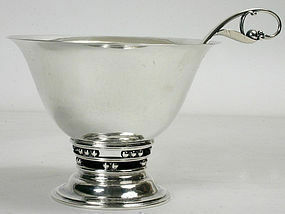 Georg Jensen, Denmark, sterling silver pedestal bowl with blossom ladle. Designed by Johan Rohde. Circa 1920. Size: 4 inches ht. x 5.25 inches diameter. Ladle - 6 1/8 inches. Excellent condition with hammered surface. Art pottery vase with flaring rim by Marblehead Pottery, c.1920-40. Size: 5 inches ht. x 8.25 inches diameter. 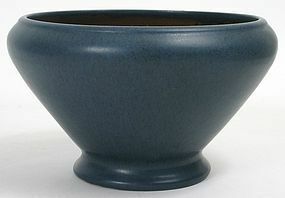 Mat blue glaze. Mint condition. Impressed manufacturer's stamp to underside of base. Tiffany and Company Art Deco cigarette case in sterling silver and two tone 14 kt. gold. Age: dated 1928. Size: 4 1/2 inches x 3 1/8 inches. 4.75 troy ounces weight. Gilt interior. Great for business cards. Good condition, minor scratches. 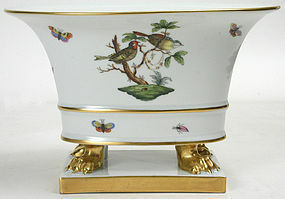 Herend porcelain cache pot in Rothschild Bird pattern. Mid 20th century. Size: 8 7/8 inches length x 5 3/4 inches ht. x 5 1/2 inches depth. Mint condition. Hand painted oval cache pot urn supported on gilded paw feet. #6455/RO. French art glass pate-de-verre bumble bee ring dish by Almeric Walter, Nancy, circa 1920's. Designed by Henri Berge. Size: 3 7/8 inches length x 2 3/8 inches width x 1 1/8 inches height. 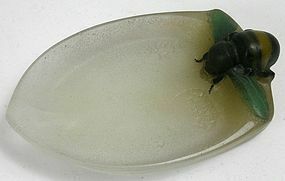 A boat shaped frosted glass dish shading to yellow and green, adorned with a three dimensional figure of a bumble bee resting on the rim. Excellent condition. Signed: Berge SC. A. Walter/Nancy on inside of dish.